24-hour airport shuttle service is available. Fees may apply. Contact the property in advance to get details. Guests planning to arrive outside of normal check-in hours must contact this property in advance for check-in instructions and an access code. For more details, please contact the office using the information on the reservation confirmation received after booking. Nice rooms, but we had a lot of street noise. 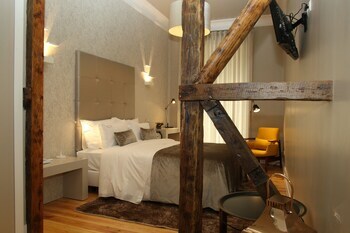 Wonderful Trip to Lisbon, this Accommodation was perfect, great location, staff, very helpful. Highly recommended. We loved our stay at Castilho House Cais this weekend. The property exceeded expectations with a well presented room, quirky entrance area and brilliant staff interaction. The staff went above and beyond to help with local area suggestions and travel. The location is ideal for the station, adjacent to the main walk into town and by many restaurants such as in the Time Out Market. We will definitely be returning to Castilho House, thank you for a brilliant stay! We had a one night stop over with 22 hrs in Lisbon. It was an excellent decision to head into the City and stay in this small, well run Hotel. It has been updated from my Google Maps search and looks really good. Reception was excellent with lots of useful info being provided and even a welcome Tea and Coffee being made for us. It is a little off the beaten track, but only 10 minutes level walk into the centre and waterfront. We took the Aerobus from the airport to Cais do Sodre which was easy and cheap. The Hotel arranged for a private car back to the airport as it was a mid morning flight out the next day. We were delighted that a chauffeur limo arrived and took us in Luxury to the Terminal in 25 minutes. Just 18 euros (bargain). Breakfast does not start until 8am but we were allowed to go into the dining area and start 15 mins early due to our airport transport. Breakfast was very good and tasty. The only thing we would have welcomed was a kettle and tea/coffee in the room. Overall, great stay and would recommend this hotel and certainly stay again. This place must have been recently renovated and it shows. Wow, just wow. Getting there can be a bit tricky because of all the one-way streets (and you definitely can't park anywhere) but it's all worth it. Check-in was friendly and quick. I had a room on the top floor and it was entirely self-contained: comfortable bed and your own toilet and shower. The guest house includes breakfast as well which was a nice selection of fruit, cheeses, bread and cereal. The guest house is close to public transport and some main sights of the city. It's also close to Time Out Market, which is great if you're looking for various food options. I made my booking through the website which was quick and easy. Unfortunately my flight was cancelled and I only discovered this while at the airport. I then tried to ring the guesthouse to arrange for an extra night stay but unfortunately this time the staff member didn't speak English. That was perhaps the only negative I can say. If you travel to Lisbon and are looking for a great value stay, make sure to check this place out!